For a second or two too long, it did not occur to me that this was not a coincidence. Oh, what good fortune that I was alone! Or I might have been tempted to point out my clever observation to someone. Funny how grateful one can be for not saying some things out loud. I’ve managed to pass myself off as a half-way intelligent person more times than I care to recall by simple virtue of keeping my mouth shut. On June 27, 2007, I will die inside just a little. 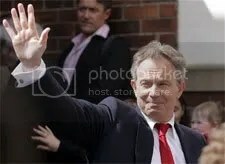 On that black day, Tony Blair will step down as Prime Minister of the UK. People alternately make fun of me or express horror that I have an autographed photo of him on a bookshelf at home. Yeah, he’s not the man who was elected in 1997. He was Bushwhacked and hijacked and dragged into compliance with America, into a war his people will not forgive him for, and I hate that. He stands by his decisions, says he still thinks he did the “right thing,” but he acknowledges he may have fallen short of expectations and trusts his people to judge his performance. The “right thing” may well have been to side with the States. Maybe he’d be equally reviled if he had not stood with our vindictive president, weakening the UK in the process. It was an untenable position for any British PM, and I think he heard the air leaking out of his own credibility the moment Bush declared “Mission Accomplished” on that aircraft carrier off the coast of Florida. However, I still have a lot of respect for him as a politician who isn’t afraid to also be an intellectual. I can’t imagine most American congressmen going up against a British MP in a debate. American politicians don’t even debate anymore. They cram as many talking points into 30 seconds as they can, whether or not it actually addresses or counters their opponents’ points. And, shame on us, we don’t call them out on it. We accept it. But these are the people we have to choose from, so one of them wins and is rewarded for bad behavior and intellectual laziness. Too bad so many of those hard-working American people can’t afford to keep themselves healthy — to enjoy the mountains and the streams, and to continue being hard-working and innovative. Our ridiculously lopsided and unfair health care system is one of the things I like least about America, but not one of the candidates would dare say something so substantive or meaningful. But I don’t have a bratty constituency to placate, and I don’t have special interest groups and lobbyists to appeal to, so I can say those things. I don’t have to promise to fix America’s problems even as I paradoxically pretend that America is so great that it has no problems. Tony Blair has also been accused of being a master of spin. He has been accused of governing like a center-of-attention, American-style president instead of a British prime minister. But I’d trust him before I’d trust many American politicians to carry out good policy. He can function simultaneously and seamlessly as a leader globally, nationally and locally; he can work with or against another president, he can defend Labour policies in his own Parliament, and he can speak to any issue in his home constituency of Sedgefield. He may soon no longer be prime minister of the UK, but he will always be the prime minister of my heart. Walking along the shoreline toward the parking lot at the beach yesterday, we saw a little kid and his dad fishing. They were standing on the beach like anyone else, but they had rods, hooks, and fishing line. It seemed unusual and dangerous to be fishing where other people were swimming, but what do I know? Flounders are weird-looking. They swim sideways, and they have evolved to have both eyes on the top side of their bodies. I wonder if it’s always the same side. And who decided: right or left? Mother nature is a slow-poke, though: Their mouths are still sideways. It was this second part that caught my attention, his high-pitched voice, his stress on the second syllable: “How un-yoo-sual!” I started laughing to myself at his precociousness as I walked away. He was beside himself with surprise, joy, pride. I heard him repeating it a few more times, probably to anyone who looked at him. A flounder! How unusual! His dad must have said it earlier. Looking at the fish on the line, the kid asking what it was, he must have said something like. “Huh. A flounder. How unsual.” And that kid, so desperate to grow up and emulate his dad, was sharing the news with us all. Summer is Dead. Long Live Summer. This morning, in the kitchen, brewing coffee and cobbling together a meager lunch, with windows open all over the apartment and no air conditioning on, I noticed a coolness in the cross-breeze that wasn’t there yesterday. There was a dry, still and cold aspect to the morning air that made my arm hair stand up and my insides go soft. I love the first time every year I notice this coolness. It didn’t last long. It may be wishful thinking, but there will be more mornings like this in the weeks to come. And one day, in mid-September, I’ll realize that it’s here — it’s really here. Autumn is knocking on the door now, and summer is too hungover to get off the couch to answer. But it won’t be long before the Tylenol kicks in and summer will step out for a Big Bacon Classic and let autumn in for a while in its absence. … is that I don’t have to moisturize. My skin is plenty moist all by itself. If I did use any sort of lotion, it would only work back out of my pores and run down my face in great rivers of heavy, milky sludge anyway. I’ve been showering three times a day at least during this heat wave. Normally, the soap would be burning my skin to a tight, dry, scaly mess. With conditions as they are, an hour after toweling off, my face has excreted a shiny, greasy sheen of salt and sebum. I could scrape my face with a strigil, like those ancient Olympians, and use the oil to read by lamplight tonight (thereby conserving electricity, thankyouverymuch, Mr. Bloomberg). The downside is that my legs, unable to breathe under my oppressive chinos, are breaking out in a marvelous display of angry-looking epidermal eruptions. I feel pretty. Can’t we just skip ahead to mid-September?